Homemade dressing is super easy and super delicious. Sweet peppers add crunch to this classic dressing. In a small bowl combine mayonnaise and chili sauce. Stir in relish, sweet pepper onion, and 1 teaspoon Worcestershire sauce. Serve immediately or cover and store in refrigerator for up to 1 week. 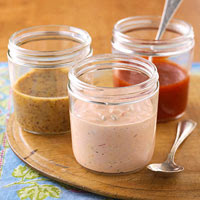 Before serving, if necessary, stir in 1 to 2 tablespoons milk until dressing reaches desired consistency. Calories 70, Total Fat 7 g, Saturated Fat 1 g, Monounsaturated Fat 2 g, Polyunsaturated Fat 4 g, Cholesterol 5 mg, Sodium 97 mg, Carbohydrate 1 g, Total Sugar 1 g, Fiber 0 g, Protein 0 g. Daily Values: Vitamin A 0%, Vitamin C 2%, Calcium 0%, Iron 0%. Exchanges: Fat 1.5. This entry was posted on 2:51 AM and is filed under Salad . You can follow any responses to this entry through the RSS 2.0 feed. You can leave a response, or trackback from your own site.